Graffiti means scratching letters, pictures or symbols on walls of buildings, sidewalks, etc. These markings are illegal and deface the building. There are various graffiti removers and sandblasting techniques that can erase these markings. Different surfaces require different removal methods. Here are a few graffiti removal tips on the methods to be used and not to be used on various surfaces. 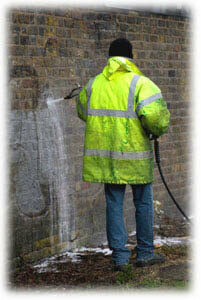 Pressure washing is the best method for graffiti removal off brick surfaces. It is recommended to use compact pressure washer with low pressure, preferably below 700 psi. The nozzle should have a wide spray. Using nozzles with a narrow spray will leave etchings on the surface. The same applies for wood surfaces. Sandblasting method can also be used on these surfaces. It is advisable to hire professional to use this method. Sandblasting done by less experienced users can cause pores in the structure that weakens the integrity of the whole structure. Another point to remember is to keep moving the tip over the painted surface and surrounding areas to blend the surface together. On soft brick it is preferred to use power washing rather than sandblasting. Baking soda / sand blasting media is a new way to remove graffiti from brick surfaces. If the wood is sealed with paint and not weathered, use mineral spirits to wipe off the graffiti. This graffiti removal method is not recommended if the wood is weathered, as the mineral spirits will drive the paint further into the wall. Use paint thinners for graffiti removal from metal surfaces and glass surfaces. Light penetrating oil can be used to wipe off the graffiti on metal and plastic surfaces. The best graffiti removal tip is to remove paint from glass surfaces is to scrape it with a razor blade. It is 99% effective. Remember to hold the razor blade at a 30° angle to the surface. Ultra fine bronze wool can be used with water to remove paint from glass and metal surfaces. Steel wool and sandpaper can also be used on metal surfaces. Repainting the whole surface should be the last option i.e. if none of the above graffiti removals gives the desired result. FAQ Discover how this mild abrasive is the medium of choice for professional blasting projects. How-to conduct graffiti removal off of brick, masonry, concrete and other surfaces.